It is hard to put a precise date on when US involvement in Vietnam ceased to be support for an anti-communist counter-insurgency and became instead an inextricable quagmire. However, Congressional passage of the Gulf of Tonkin resolution seems like as good a point as any. With hindsight, it is clear that the United States confused the very nature of the conflict that they were fighting. Vietnam was fundamentally a war of national liberation—a struggle that had begun centuries before against Chinese dominance, then French, then Japanese and finally the United States. While the American government may have never realized that they had fallen into the role of “foreign oppressor,” that fact did not diminish Vietnamese resistance. Like most colonial wars, it came down to a calculus of cost. US interests were simply not worth the costs in national morale, military manpower and economic resources that Vietnam was consuming. But humbling a superpower is a long process, and so it was in Vietnam. Quagmire has three main uses. The first, and most direct, is that it cancels NORAD. (It doesn’t actually prevent NORAD, so NORAD can still theoretically be triggered after Quagmire.) If relevant, this is usually enough of a benefit for me to play it for the event. The second is to hope that the US rolls really poorly and gets stuck in the Quagmire for an extended period of time. If they fail their rolls, you get to conduct back-to-back Actions, one of the Holy Grails of Twilight Struggle. The benefit of consecutive Actions is almost always immense: it can let you flip a battleground, get into an otherwise inaccessible region, set up a vital realignment, score a region undeservedly advantageously by temporarily breaking control, or a whole host of other possibilities. Of course, the odds are against you. If you play Quagmire and they successfully discard and roll, then nothing has really been accomplished, except you gave up a nice USSR event and probably so did they. 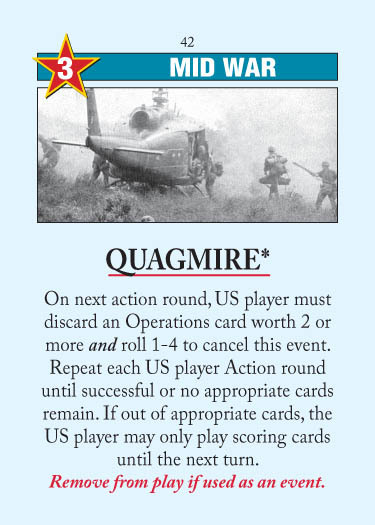 The third main use is to time Quagmire so as to force the US to skip a crucial round. For example, you can play it as an AR7 play, to deny the US their own AR7 play. Or you can headline it, causing the US to miss their AR1 and allowing you a back-to-back AR1 and AR2. It is especially nice on Turn 10, because missing out on the Turn 10 AR7 play will usually come as a nasty surprise to the US. Accordingly, I usually trigger Quagmire as USSR. The main exception is if the US is under Containment for some reason, or if NORAD isn’t out and I desperately need the Ops. But I will often hold it for a turn or two and hope to draw it with Red Scare/Purge, because that combo can be game-warpingly powerful. I almost always space Quagmire. Note the crucial difference between Quagmiring yourself and being Quagmired: when the USSR Quagmires you, you usually just get out on the first discard, and nothing of value was lost. But when you Quagmire yourself, you guarantee the USSR at least one set of back-to-back Actions, and possibly more. (Note also that when you Quagmire yourself, the USSR gets to know in advance when you will be emerging from the Quagmire.) There are simply too many things a strong USSR can do to you with a set of back-to-back Actions to risk self-Quagmiring, and cancelling NORAD only adds further fuel to the fire. There are exceptions however. Sometimes you have too many problematic USSR events in hand and the Quagmire discard is the only way to escape. Rare is the hand, though, that genuinely calls for a self-Quagmire. A better instance is when your last two cards are Lone Gunman and Quagmire and you can’t hold a card; here, Quagmiring yourself is the only way to avoid DEFCON suicide, because by skipping your Action Round with nothing to discard, you are “holding” Lone Gunman to next turn. This entry was posted in Mid War, USSR Events and tagged quagmire. Bookmark the permalink. My question is : what happens if the US cannot cancel Quagmire in the turn it was played? Will Quagmire be active in the next turn from AR1? Having the card title underlined with red suggests that it will have lasting effects. Cards that both cancel and prevent an associated event will say as much on the card, An Evil Empire and its effect on Flower Power is a good example of this. As for how long it lasts, the only condition that ends Quagmire, and its sister card Bear Trap, is to discard an appropriate card and then roll the right number. So, not even the end of the turn will remove it. My general principle is funnily the opposite of theory’s. I like to trigger it commonly as US, as USSR only if something special is also going on (I have played Red Scare or Norad is in effect or the game is going to end). Really? Quagmiring yourself is a nightmare! The USSR has two consecutive goes. I’d say that’s only worth doing if you’ve got a suicide card and no other option (e.g. WWBY). I’d send this to space every time. If the USSR gets it in his hand later and has RS/P on me, well that’s just good luck or well played by him. Rules question: USSR headlines Missle Envy and the highest card in the US player’s hand is Quagmire. On AR1, does the US player use Missle Envy to conduct ops and then on AR2 start discarding and rolling to try to get out of the quagmire? Or does the US player have to discard Missle Envy on AR1 and roll? Or does US play start discarding and rolling on AR1 and then be forced to use Missle Envy to conduct ops on the next AR after he gets it of the quagmire? This happened in my last game. We voted that option 1 made the most sense since the card specifically says that it must be used for ops on the next AR and Quagmire says “on the next action round…” Is this right? What is USSR plays Missle Envy for the event on an AR when the US is still in the quagmire? Same result? “Q. How does one deal with a Missile Envy placed in one’s hand when under the effect of a Bear Trap or Quagmire? This does bring up another interesting question though: if you are under Scare/Purge and you get Quagmired/Trapped via Missile Envy, but you have OTHER cards that are 3+ Ops, then are you stuck until you are no longer Scare/Purged? Or can you discard a different card and must use the 2 Ops Missile Envy as soon as you are legally able? I’m tempted to think it’s the former (which is nasty), but I’m not 100% sure (the answer above leaves it a little ambiguous). Thoughts? You can discard another card to Quagmire and you must use Missile Envy for OPs on the first legal occasion. If I am quagmired, I have one scoring card and some 1Op cards, no higher cards and I am not under Containment, am I forced to score on AR6 can I pass and play the scoring card on AR7? Twilight Struggle doesn’t allow you to “pass” if you have a non-China Card legal play (and it’s not North Sea Oil / Space Race’s “may” take an extra action round). So I’d assume you must score as soon as possible then pass the rest of the rounds, for all that this is what you usually want to do anyway since it’s unlikely your position is going to get much better. I know my position normally doesn’t go any better but I may have known some cards of my opponent and know that he must make his position in region worse. The Quagmire text uses the word “may” as well so your argumentation did not convince me. This ruling does use the word “may”, but I think in this case it is used to modify the portion of the sentence to indicate order of play of Scoring Cards (“may be played in any order”), and not the timing of when they must be played (“once the player no longer has Ops cards that meet the requirement”). I suppose I can see the alternative interpretation, but it appears more strongly to me that it is a requirement to play Scoring Cards as soon as you can once you no longer have valid discards. So, if one plays Red Scare, then this card, and the opponent is unable to discard any more cards or get out of the Quagmire by the end of the turn, and ends up holding a scoring card – that’s game, isn’t it? This is addressed at length in the comments above. Discard card, roll a dice to cancel Quagmire, take your action. If you run out of cards to discard then you can only play scoring cards for the rest of your turn. Obviously this is wrong as everyone online is talking about missing your Action rounds and back to back AR’s for the USSR but I just don’t see this written on the card. Please could someone answer this? I’m relatively new to the game and am having the same thought. What happens if you *do* still have cards you can discard, but also have scoring cards you must play? For example, if it’s AR7 and you’re holding a 2-op card and a scoring card, do you have to discard the 2-op card and hold the scoring card? And if so, do you lose the game? I am pretty sure then you play your scoring card, and Quagmire carries over to the next turn. Found an answer in the bear trap section on bgg forum which confirms theory’s statement. This card, as well as Bear Trap can really be game changers. I just played a game as US and my opponent was successful with his 1st die-roll, while in the same turn, it took me 4. Correct, but you have somewhat more knowledge of when the US is coming out compared to if you Quagmire the US.